The Great Sioux Reservation was created in 1868 with the signing of Fort Laramie although subsequent treaties in the 1870’s and 1880’s broke up this reservation into several smaller reservations. The Cheyenne River Sioux Reservation, named for the river along the southern border of the reservation, was formed in 1889. 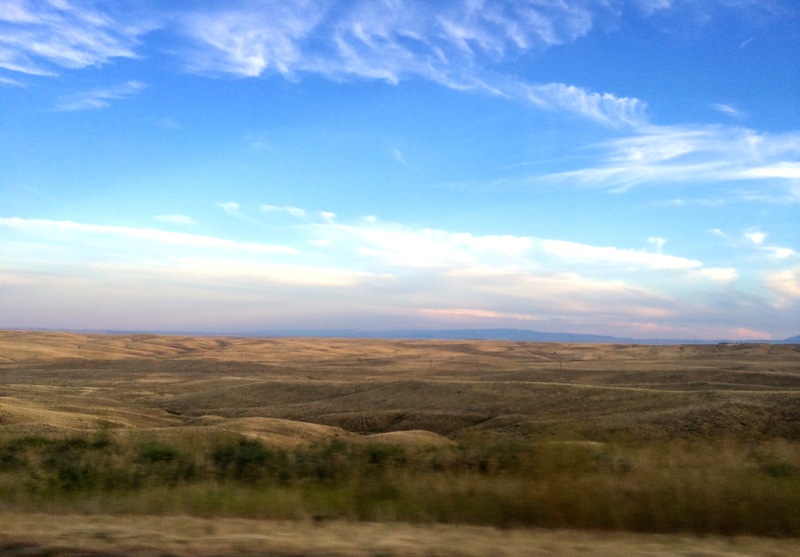 This 2.8 million square mile reservation (larger than the state of Connecticut) is home to representatives of four of the traditional seven banks of the Lakota: the Minneconjou, Oohenumpa, Itazipco, and SiHaSapa. The Land Acts of 1909 and 1910 opened up Cheyenne River Reservation to non-Native settlement, and so the reservation is now checker-boarded. Additional land was lost to Native people when in 1948 the US government dammed the Missouri River for electrical power and flood control, which submerged 8% of the reservation land. 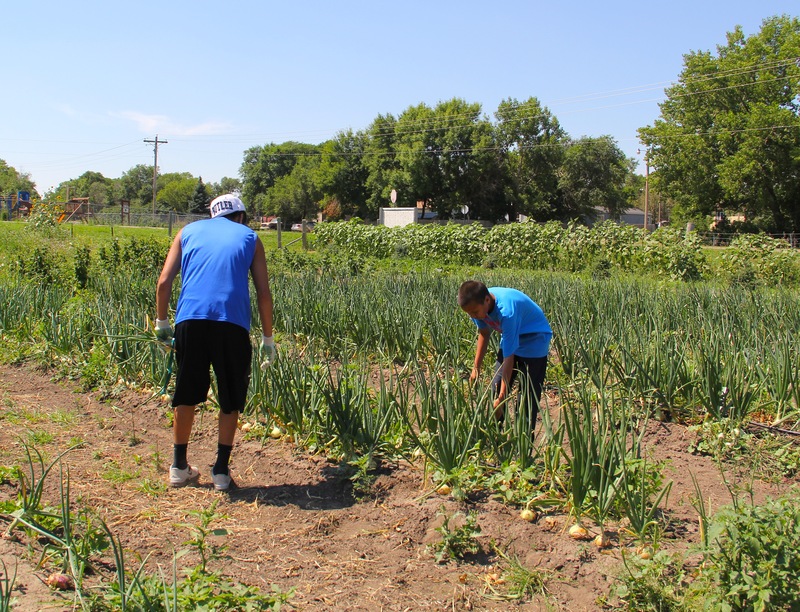 We drove through the rolling hills of South Dakota to the town of Eagle Butte to visit the Cheyenne River Youth Project, and the Winyan Toka Win Garden. This region is known for its beauty, and the difficult circumstances through which its residents persevere. Two-thirds of the population of Cheyenne River survives on much less than one-third of the American average income. 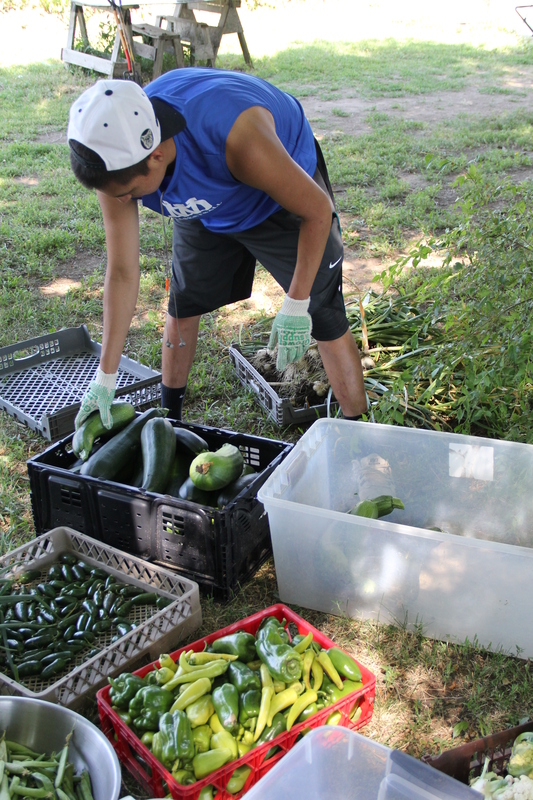 The Cheyenne River Youth Project (CRYP) works hard to support local youth and their families by providing frsh, nutritious locally grown foods; much-needed household items; culturally appropriate youth programs; nad a variety of valuable community resources and special events. Entering the town of Eagle Butte through its Main Street, the first establishment one used to encounter was a bar called The Little Brown Jug. In 1988, the tribal chairman decided this shouldn’t be the case. The tribe bought the bar from the owner, and then solicited suggestions from the community for better uses for the building. A group led by current CRYP director Julie Garreau said they should turn it into a youth center. 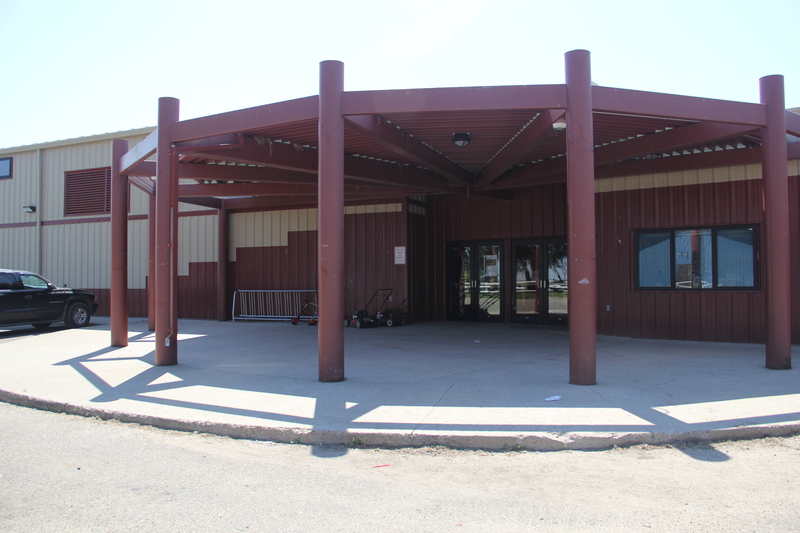 They were successful, and this served as the home for the Cheyenne River Youth Project until 1998. A blizzard in 1996 shifted the foundation of the building, leading it to be condemned. Famous Lakota runner Billy Mills found out about the center when he was in town for the ribbon cutting on a new dialysis center, and helped the program to get a $75,000 match grant. In 1999 the Billy Mills Youth Center (known as “The Main” carrying forward the name of the previous center) was completed and the CRYP moved in. Julie, who had been working as a volunteer for 12 years to run the program, was now able to work as a paid director. 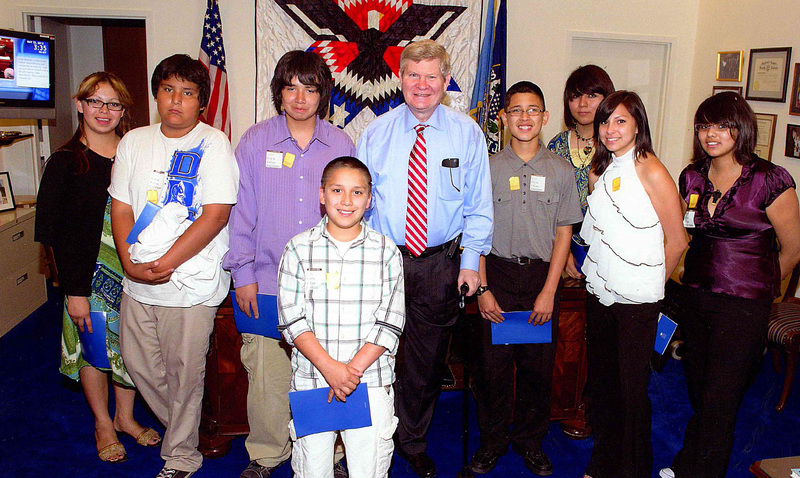 In 2004, CRYP partnered again with Mills’ organization, Running Strong For American Indian Youth, to build the Cokata Wiconi Teen Center, next door to the Main Youth Center. While the previous center had focused on youth ages 4-12, the new Teen center allowed CRYP to expand programming to youth ages 13-18. The center has a full-sized basketball court, a fitness center, an internet cafe, a computer lab, dance and art studios, as well as private volunteer quarters (which CRYP was kind enough to host us in, as hotels are scarce in Eagle Butte). 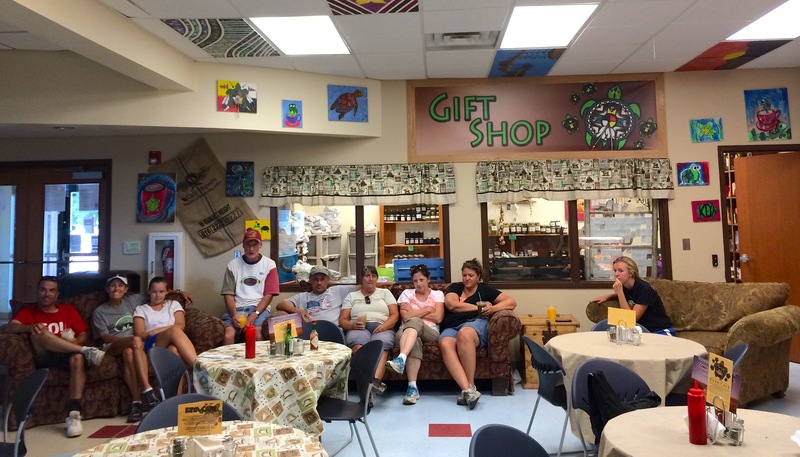 These quarters also host volunteers from around the country, and around the world, who come to work with CRYP, and whom Julie sees as ambassadors for the Lakota community when they return to their home states and countries. 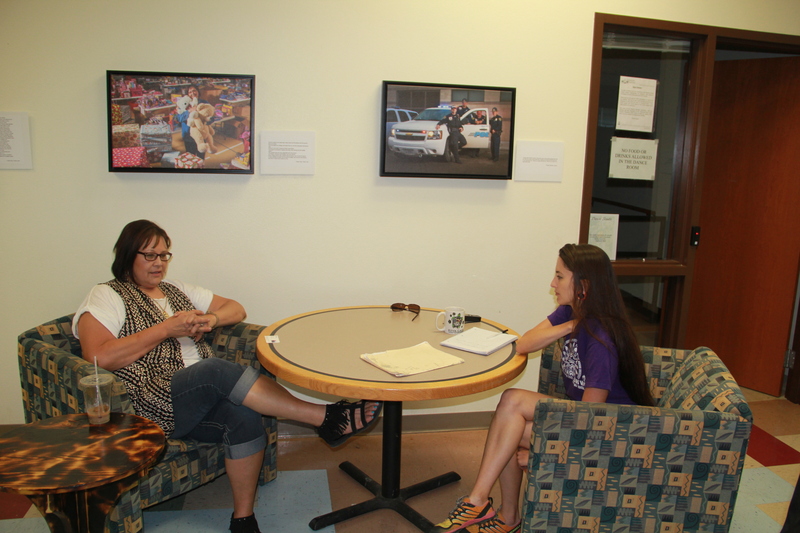 Through these volunteers, the youth at CRYP are able to learn about other places, and these volunteers are able to bring knowledge about the Lakota back to their communities, to help battle stereotypes about Plains Indians and reservations. Building the Center has been a gradual process- computers came gradually to the lab, it took a couple of years to install the kiln and air filter systems in the art room, and the library still needs shelving for the books that have been coming in. The teen center runs programs to help local teens deal with gang violence, alcohol, teen pregnancy, dating violence. The Midnight Basketball program from 10pm -2am Friday nights provides a safe space for teens to hang out and be active. CRYP also collects formal wear and hosts a “Passion for Fashion” night which gives teens the opportunity to dress up and learn about fashion, hair, and make up, to help them feel confident and prepared for their prom and other events. Recognizing that they could help the youth while they were at their programs, but at the end of the day kids still went home, the CRYP developed the Family Services Program, in order to serve youth by supporting their parents, grandparents and other relatives. For $30 a year, families purchase a membership, which then entitles them to goods and services provided by the program. CRYP sees this as a healthier alternative to a charity program; participants have purchased memberships to support the program, and the program seeks to match them with the things that they need. Donations can be unpredictable, so rather than just offering things people don’t really need, families create lists and CRYP fills them as the appropriate donations come in (Youth Program Director Tammy Eagle Hunter described how one year they received lots of self-tanning lotion that turned people orange). They also offer a heat match program, in which CRYP will match $100 that the family spends on heating fuel. In addition, every Christmas CRYP runs a Christmas Toy Drive in which they accept letters to Santa, and then work to match 1200 youth with their requested gifts. A similar drive is held in the fall for school supplies. 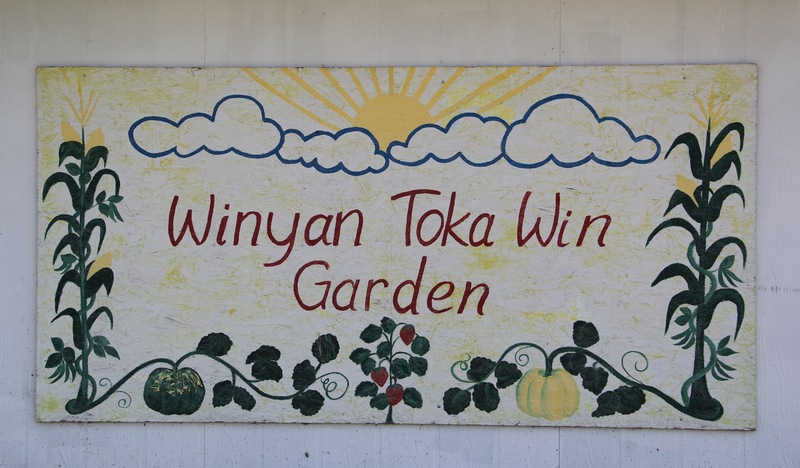 The Winyan Toka Win (“Leading Lady”) Garden was initially started in the 1970s by the Elderly Nutrition Center, through a program called Green Thumb, as a way of keeping elders active and provide them with healthy fresh food. The Elderly Nutrition Center coordinator was Julie’s mother, Iyonne Garreau, for whom the garden is named. 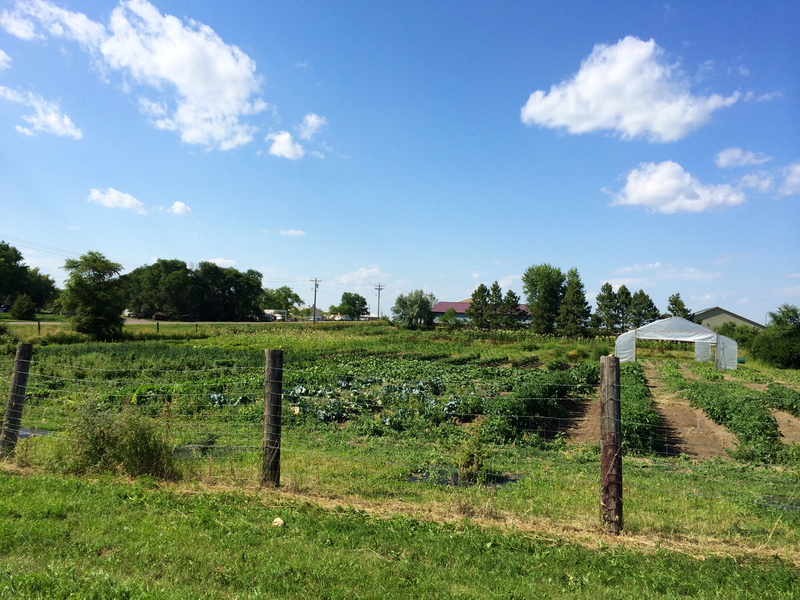 She turned the 2.5 acre garden over to the CRYP in the late 1990s when she was no longer able to work in it. 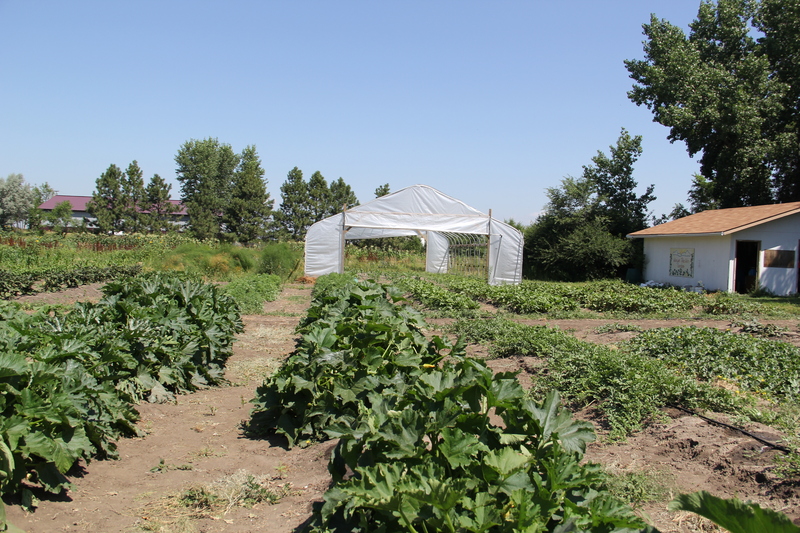 When Julie first agreed to take on the garden, she wasn’t just thinking about produce. She described how she “would look out my window and kids would be walking by and they would throw their garbage on the ground and I feel since we are a land-based nation and we talk about respecting the earth, our kids weren’t getting that or connecting with that land. So, I looked outside and said this is what we need to do. We need to get them to work the land. We need to get them engaged to earth and understand what that earth can do for you… I’m not a gardener, but I knew kids and knew what we needed to do. So, producing food was just a perk.” Tammy similarly described a disconnect for youth with a land based culture, and that “What we have discovered with a garden is that if we get the kids out there for garden club, we’ve discovered if they’ve helped plant it, if they’ve helped weed it, if they’ve helped take care of it, if they’ve harvested it, they’ll eat it.” Since Native communities disproportionately suffer from metabolic disorders, having access to fresh garden produce is important. 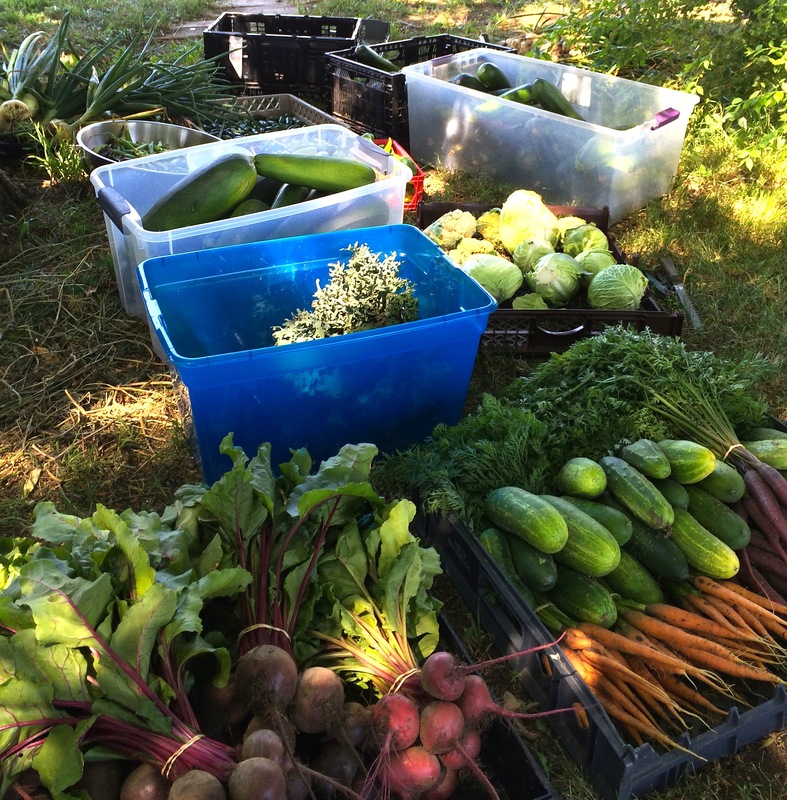 When we dropped by this summer, the garden’s sustainable agriculture manager was Ryan Devlin, who is originally from the suburbs outside of Boston and who studied agriculture at Cornell University. Ryan coordinated the planting of the garden, as well as activities for the youth programs and the internship program. This summer there was a 9 person intern group, a six person intern group, and while we visited a two person intern group (because of two left-over positions from the previous group). Interns work every morning, five days a week for 60 days, earning $500 in the process. There is also a garden club program through which kids come outside for half an hour, three times a week to work in the garden. Depending on the week, numbers in this program range from 3 to 30. 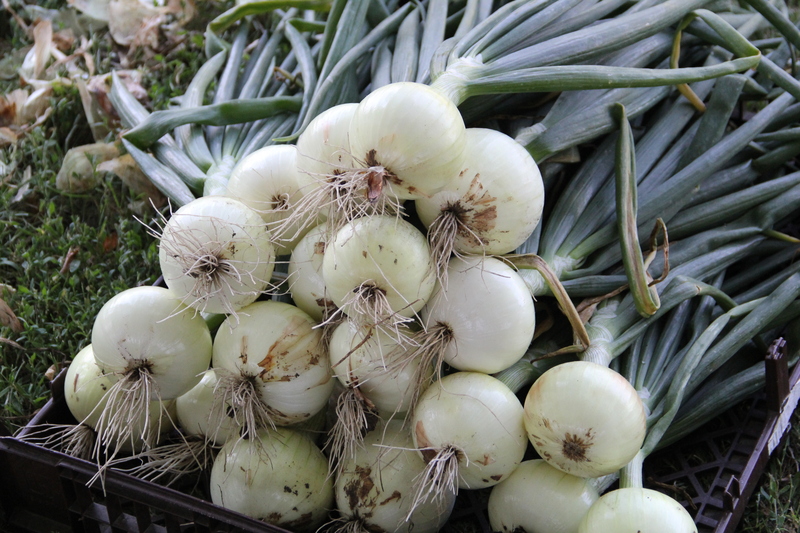 Produce from the garden is sold at the weekly farmers market (Fridays from11am-4pm), used for snacks at the Main and the Teen Center, used meals sold at the Keya Café, and anything left over is canned to be sold in the gift shop. Snacks for the youth program used to be food bank donations, so this included a lot of junk food like Rice Krispy bars. Tammy recalls that it was a struggle to transition the kids from this to broccoli, carrots, celery, and even apples and oranges. She sees the garden as a big part of “Planting seeds for healthier choices.” For 20 hour a week, 175 kids aren’t eating hot Cheetos. Her hope is that these youth will then take these habits home to their families. 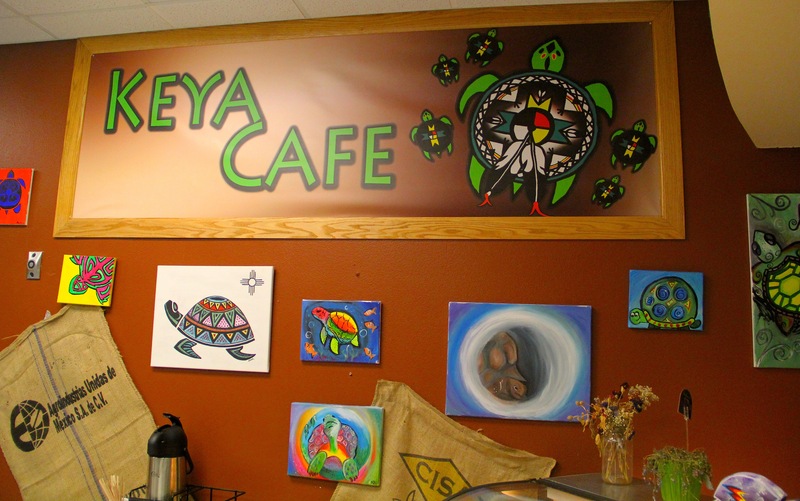 The Keya Gift Shop, located off the main lobby of the Cokata Wiconi teen center, opened in 2006. The shop includes preserved goods from the garden, including dill pickles, canned tomatoes, pickled green tomatoes, apple chutney, salsa, zucchini jelly, strawberry rhubarb jelly, jalapeño jelly, pickled jalapeño peppers, pickled radishes, bread-and-butter jalapeño peppers, onion relish, sweet pepper jelly, strawberry jam, tomato jam, zucchini pasta sauce and spicy white pickles. 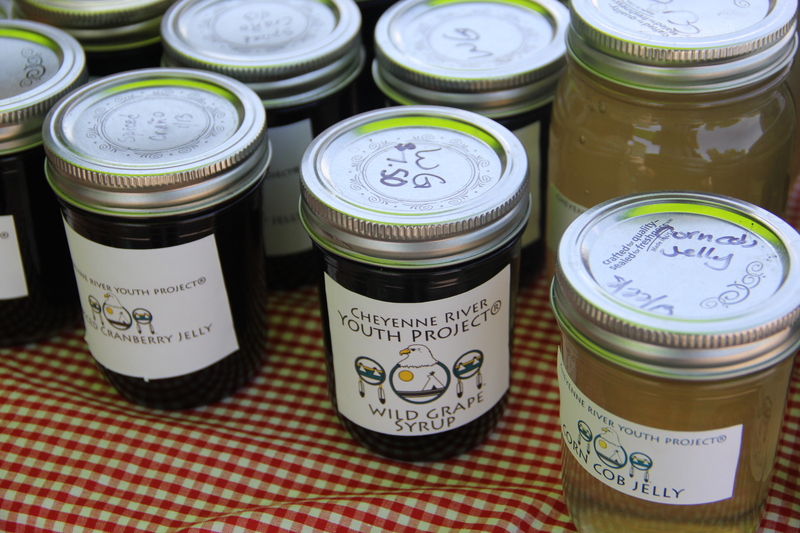 CRYP also pays local people to gather traditional wild foods, turning them into goodies like wild plum jelly, wild plum syrup, wild grape jelly, chokecherry jelly, chokecherry syrup, dried turnip braids, and dried teas. During our visit, ceyaka tea was draped out the center drying, to be packaged as tea. The herbal, slightly minty tea was also offered in the Keya Café, where we had the opportunity to eat breakfast and lunch while we were there. The Keya Café, part of CRYP’s Social Enterprise Initiative, is located just across the hall from the Gift Shop, and served us delicious breakfast burritos (with salsa fresh from the garden) and chef salads for lunch (also with ingredients from the garden). They also serve coffee, smoothies, and sandwiches. Locals as well as tourists trickled in throughout the day, and expressed to us their happiness in having a place like this to stop for a quick meal. 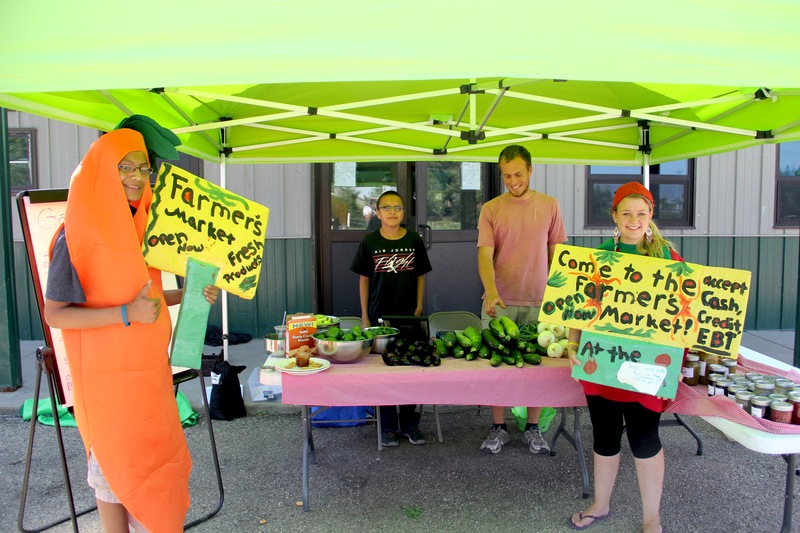 Youth from the community are trained to prepare the food and run the register. It took some time to open the café (the building opened its doors in 2007, but the café didn’t open until 2013), but the business hit the ground running and is currently turning a profit, which is unusual for a new business. Proceeds beyond what is needed to pay the employees and run the café are funneled back into the CRYP programs. 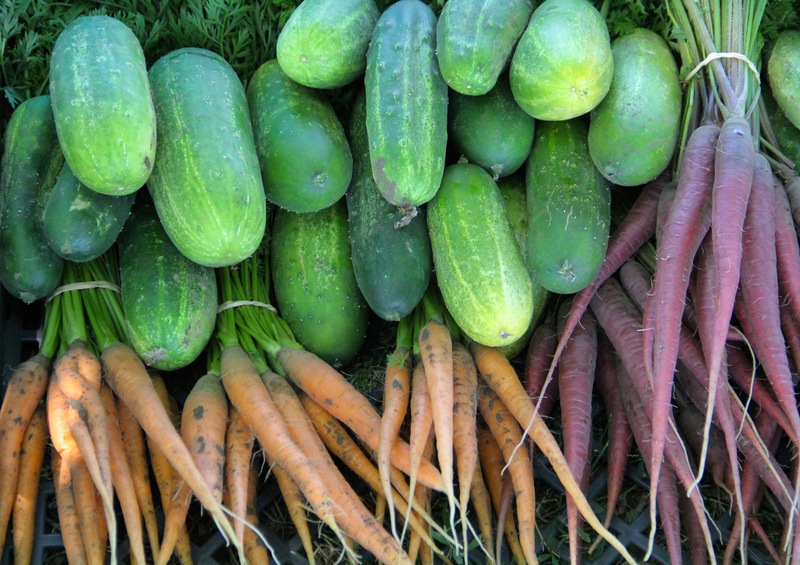 CRYP also offers cooking classes, so that the youth will know what to do with the produce. 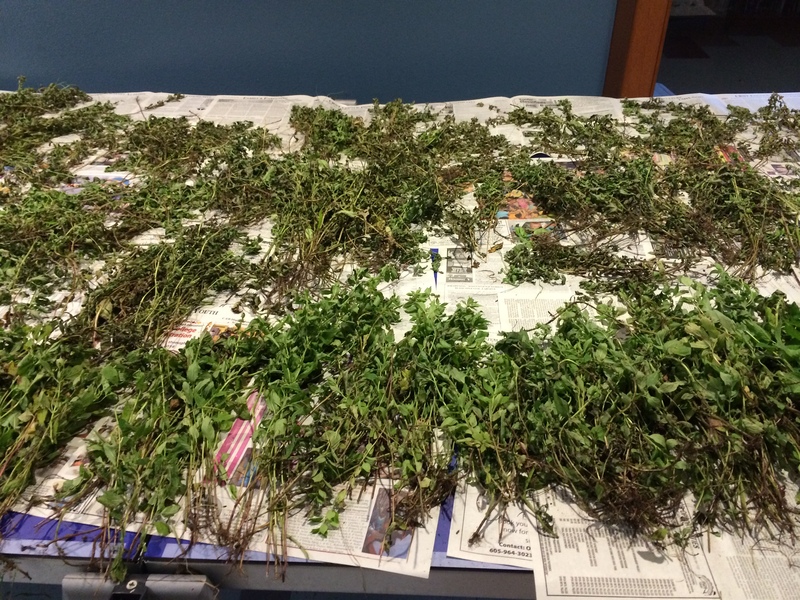 Tammy explained that this is important because “vegetables are still kind of foreign to us. Most of the kids have grown up on commodities. We know what canned peas are. We know what canned green beans are. We know what fry bread is, and what lard is. We know what luncheon meat is. That is what we knew, and it’s kind of hard to change. 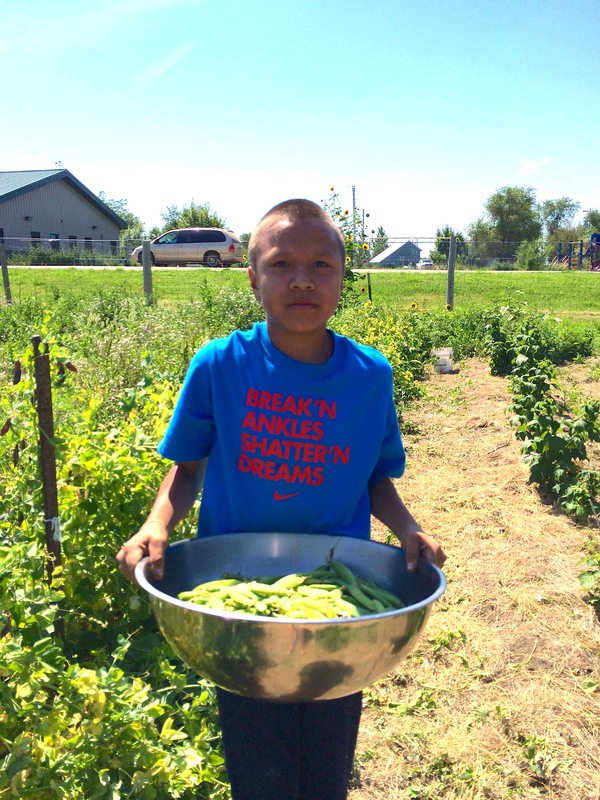 We are working on trying to create that change.” Last year the program included 12 youth in 5 weekly classes, taught by Lakota chefs from Rapid City. 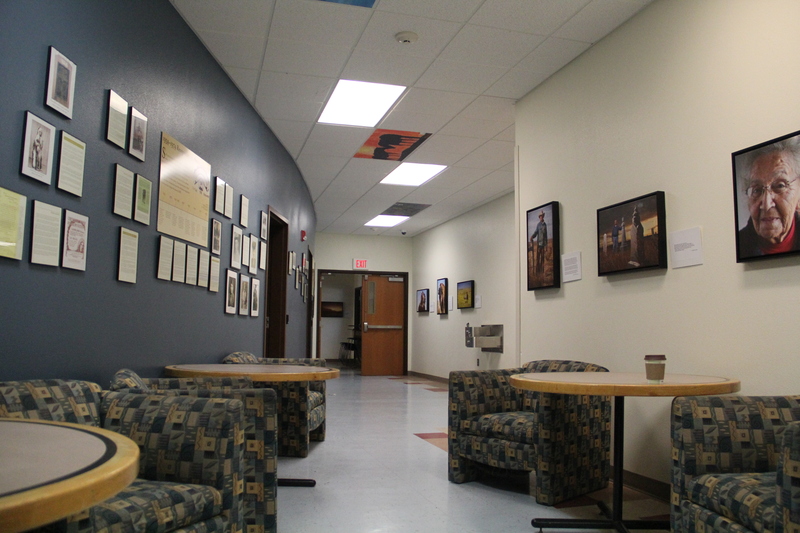 Hallway of the Teen Center, which contains a photography exhibition by Richard Steinberger and Matt Normann, highlighting the great beauty to be found in unexpected places on the Cheyenne River reservation. 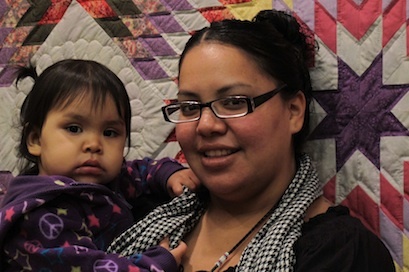 Teens from two reservation high schools submitted creative writing to accompany the photos, which appear in the art exhibition and will be incorporated into a future book. The portrait to the right is Marcella LeBeau, a WWII army nurse who also traveled to Scotland to have a Ghost Dance shirt taken from the Wounded Knee Massacre site returned to the community. Photo by Angelo Baca. Well written article—The article covers the history of the area, describes the programs offered and states the “mission” in a wonderful positive manner.